Venice has fascinated the world for years. On my first visit I looked for the perfect scene to convey her beauty, charm and romance. Venice has fascinated the world for years. On my first visit there, I looked for the perfect scene to convey her beauty, charm and romance. I think I may have found it – and I now offer it to you. The cafe's door and the vine that adorns it caught my attention in a small village in Scotland. 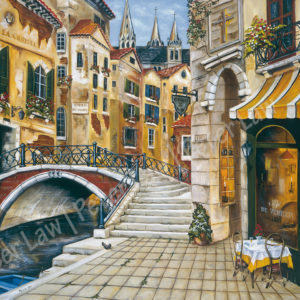 Here I have taken these two elements and set them into this scene from Italy. I have always loved the red brick buildings of old England. Add to this the quaintness of its structures and the charm of its village storefront shops and you have the potential makings of everything visually romantic. It is possible to live our lives hidden behind a protective façade. We allow people to see some of our imperfections, but may be reluctant to reveal who we really are. 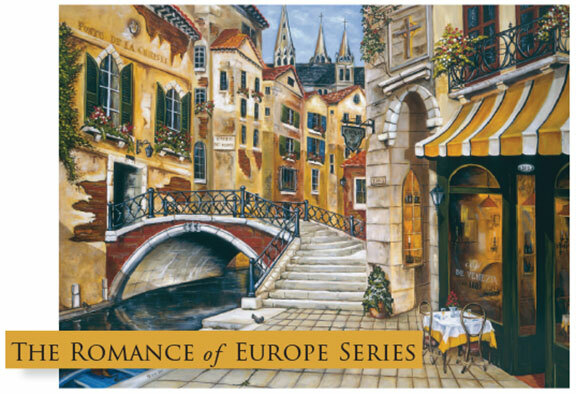 A set of all seven Romance of Europe greeting cards. The cards are 6.25″ by 4.5″ folded (A6). They come packaged in a clear plastic box with a cover and back describing what the Romance of Europe series is about. A portion of all proceeds from sales on Peter Law Artist are used to fund the ministry of Engage International. Of all the bridges in Venice, this one intrigued me most. But it needed a cafe, a table for two and the prospect of a few moments of solace. This cobbled street, located along the French Riviera near Nice, offers silent testimony to centuries of colorful history. I have set out to capture its charm on canvas. This cobbled street, located along the French Riviera near Nice, offers silent testimony to centuries of colorful history and I have set out to capture its charm on canvas. 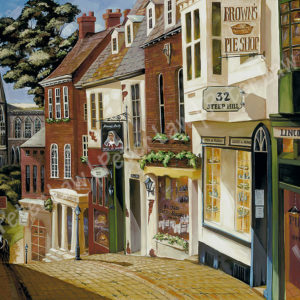 Welcome to Peter Law Artist website. 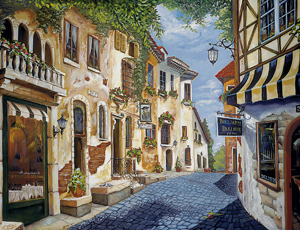 We hope you enjoy Peter’s paintings as you explore his “Romance of Europe” series. 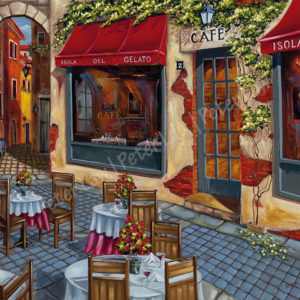 Experience the narrow streets of an Italian town or imagine dining in a streetside cafe. Currently we offer the paintings as archival quality gieclee prints in a variety of sizes. Capture the experience of Europe! Greeting Cards now available! Romance of Europe seven card set available here.